Retired Chair of the board of directors and Chief Executive Officer of DuPont, positions he held for 11 years. He was a director on the board of directors at Bank of America since 2009, and served as Chairman from 2010 until October 2014. 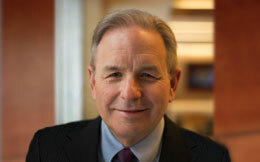 He serves as a member of the board of directors of Deere & Co., and CH2MHILL. He is a member (Chair) of both the National Academy of Engineering and the Executive Committee of Sustainable Energy for All (SE4ALL). He is Chairman Emeritus of the board of the U.S. Council on Competitiveness, a founding member of the International Business Council and previously served as Chairman of the following organizations: Catalyst, an organization supporting women’s advancement in leadership positions; The Business Council; Society of Chemical Industry, American Section; and World Business Council for Sustainable Development (WBCSD). How the issues of competitiveness and sustainability are intertwined and how communities can gain an edge by prioritizing sustainability.